Last month, we discussed the different types of glass and their various uses around the home. A patterned or textured glass can transform a room, from adding a detailed or decorative conversation point, to softening the light quality of different rooms. Here at Abbey Glass, we are committed to providing an informed and high quality service to all our customers. We’ve explained what patterned glass is, and how you can use it in your home, in more detail below. Patterned glass can also be known as decorative or textured glass, and can have a wide range of patterns on it. It is used often to diffuse rather than obscure an object when viewing, and is a popular choice for added privacy in a home or simply to add a decorative touch to a room. This type of glass is made by passing molten glass between two rollers, which emboss the chosen pattern onto the glass. The glass most commonly comes in 4mm or 6mm thickness with a variety of prints that can increase or reduce the amount of light allowed through the glass. 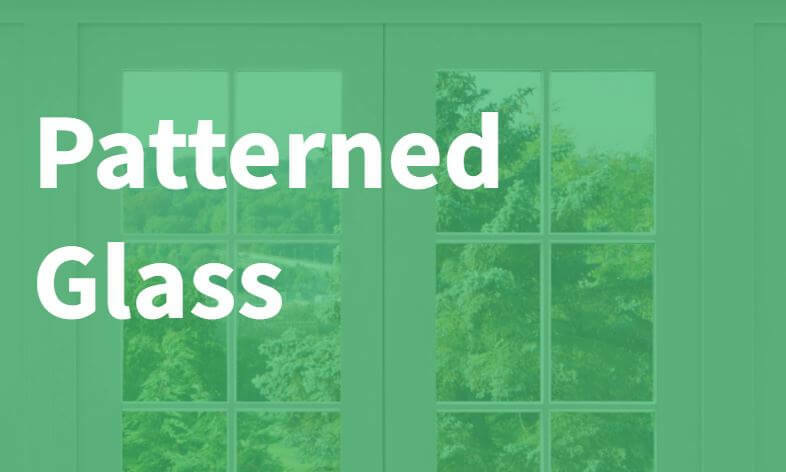 Why use patterned glass in your home? Patterned glass is perfect for rooms where light and privacy are required, for example, bathroom windows. The patterns mostly obscure the room from external viewing, allowing you privacy within your own home, but still let plenty of natural light through the glass. Likewise, the patterns have an added effect of softening the light in a space, adding towards the creation of an ambient space. Where can patterned glass be used in your home? As mentioned above, bathroom windows and even doors are ideal rooms for installing patterned glass in. However, it can also be used for shelving, furniture doors, interior partitions and shower screens. The glass also has the option to be toughened to meet safety requirements and provide enough security to be used in panelling for front doors; providing an ideal balance of light and privacy. Here at Abbey Glass, we provide a high quality decorative glass service everytime. We have a variety of grades and textures available, ensuring you can find the perfect solution to suit your home without compromising on quality or design. Contact our friendly team today to discuss the services we offer, or for more information on patterned glass, and we’ll be more than happy to help.